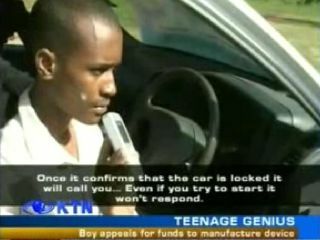 An 18 year old from Kenya has invented the 'Block and Track' system, which allows a user control over a vehicle using a mobile phone. Morris Mbetsa developed the anti-theft and tracking system despite having no formal training, thanks to a love of taking gadgets apart. Using a combination of voice, touch-tone key presses and SMS, the car can effectively be authorised only by the owner. When the ignition is started when the car is supposed to be locked, the vehicle rings the owner and he or she must punch in a code to allow it to start. The system also can patch in to the car's conversations, so if your hot-rod has been hot-wired you can hear the thieves laughing and congratulating one another. Better hope they accidentally read out the address of their secret hideout too, eh?